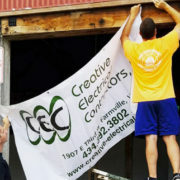 September 2016 | Creative Electrical Contractors, Inc. 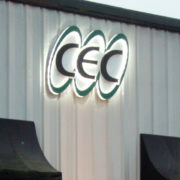 Exciting news for CEC… after settling into our office 17 years ago in September of 1999, we just recently partnered with Joe Giles Signs, Inc., here in Farmville to create and install our company logo on our building. It is the perfect touch! The Farmville Jaycees is a community organization that coordinates several family friendly community activities for the area every year. One that CEC has sponsored for several years is First Fridays, a monthly concert series where many local vendors all come together for a good time with live music and delicious food. CEC and several other local businesses in the community helped design and execute the “Field of Dreams” complex here in the Town of Farmville. 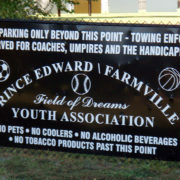 CEC is proud to continually sponsor and support the Prince Edward/Farmville Youth Association in their efforts to provide sporting teams and events for the youngsters in the area. 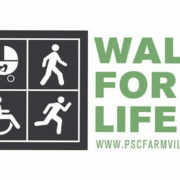 This year, CEC is proud to sponsor the Pregnancy Support Center of Southside Virginia’s Annual Walk for Life. President Mark Southall’s wife, Tammy, also volunteers at the Pregnancy Support Center, a non-profit that has provided free and confidential services to women, teens and families in the Southside Virginia area since 1984.